Just like many 2nd generation Hallyu wave fan, I’ve long hear of the legendary Shinhwa since I stepped into the Kpop world. During their 10th year of promotions even though I was very a part of the Kpop scene, the spread of Kpop wasn’t as wide as it is now that it wasn’t as easy to gain access to every live performance. Unless you really looked for it, could you find a specific live performance that was at least of decent quality. At that time, DBSK and Big Bang and kdramas took up much of my time, I wasn’t going to spend my time digging up on a older band which I wasn’t sure if I would even like. Thanks to the easy access of live music programmes’ broadcasts on YouTube, (and cable tv), their recent promotions for their single ‘Venus’ did not go unnoticed this time. On closer look and research (via Shinhwa fans and the Internet) I have come to like Shinhwa more than just a fan to an idol. I respect and envy them more than anything. These guys have overcome the biggest obstacle (SM) to stick together for 14 years, which is the longest period a boy band has been together (in Korea at least) and is what every band would want to achieve. According to fans, after their 5 year contract ended with SM, only 3 members were offered a new contract. Fortunately (unfortunately for SM) the boys friendship was so strong that the 3 who were offered a renewal of contract decided not to take it up. Instead, the group went to court with SM to fight for the rights to retain their group name Shinhwa even out of SM. it has been said that much credit goes to their leader Eric who had a hand in keeping the band as one. (I wished DBSK did that too) Now that’s what I call a leader. 14 years since their debut, Shinhwa returns with their 10th album ‘The Return’ looking more manly than any boy band going for the manly look. (it is said that the guys have mentioned that they did not just produce 10 songs to create a 10-song album but produced a lot of songs only to choose the best to be placed in the album, who won’t respect that?) 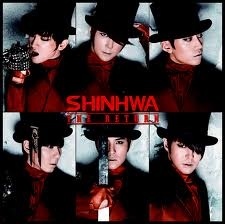 The cover of their album is as sleek as ever, with the men looking great in top hats and red suits. With their return, signals the start of their new variety show ‘Shinhwa Broadcast’. The. Show. Is. Hilarious. The first few episodes had me laughing from the start to the finish then there were some that made me cry. This is probably the first variety show where I laughed this hard since Running Man. The show was a great way for me to learn the names of the members without rewinding the MV a million times while trying to match face to name. On the show, the guys really just let go and are all natural (even in their awkwardness), after all, they have nothing to hide now that they are beyond the ‘collect-fans’ stage. Seeing as the guys had a hand in creating the show, I’d say they did a great show, though some parts could have been improved (less draggy maybe). Other than that, this girl has nothing else to complain about. Even though Shinhwa announced that for this round of promotions, they never intended to aim for winning on music programmes (though they did), I’m sure that they gained more fans this time. 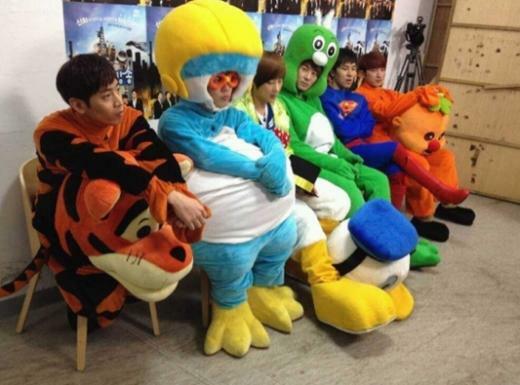 What with the easy access to their performances and variety show, I’m pretty sure that many more like me have jumped into the Shinhwa band wagon. “The. Show. Is. Hilarious”…..yep totally agree, I though only Super Junior and MBLAQ was able to crack me up….I was wrong XD I just love those man seriously they killing me… A lot think SuJu are THE varieties king….nope, I’m a huge fan of Suju but I must say Shinhwa win right away….can’t wait to watch the next ShinHwa Broadcast with SHINee XD.